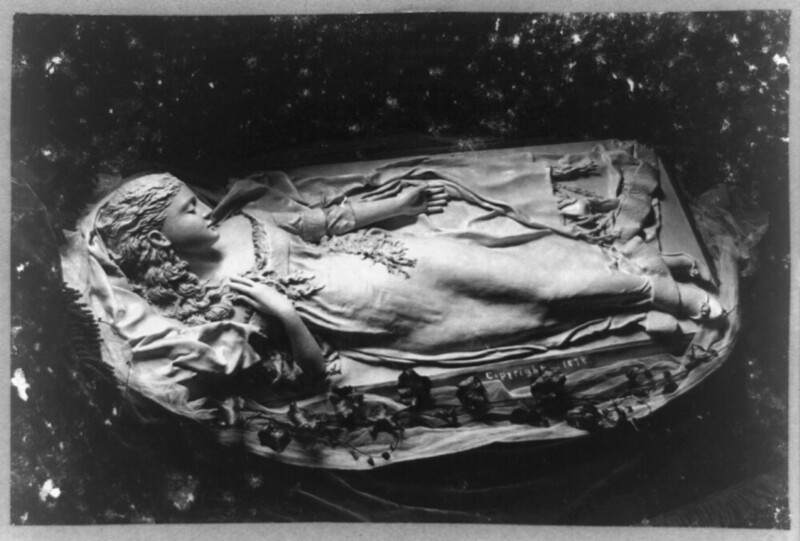 Stereograph showing The Dreaming Iolanthe (1876), a study in butter by Caroline S. Brooks – Source. Butter as a sculpting medium can be traced back to “banquet art”, a tradition most associated with the Renaissance and Baroque periods. In the same vein as sugar art, it was a way of bringing entertainment to the table and usually signified a special occasion or part of the meal. The earliest reference to the practice dates from 1536 and details the creations of Pope Pius V’s cook Bartolomeo Scappi, among which could be found an elephant and a tableau of Hercules engaged in combat with a lion. Although these sculptures were only placed on the table long enough to impress the guests, the American sculptor Caroline Shawk Brooks (1840 – 1913) managed to exhibit her butter sculptures in galleries and exhibitions by using ice to keep them from melting. Brooks had always had an interest in art and, after marrying a farmer, she made her first butter sculpture in 1867 as a way to promote the product. Not using moulds, she was admired for utilising traditional tools including a butter paddle, broom straw, and a “camel’s-hair pencil”. In 1873, she made a sculpture of the blind princess Iolanthe from Danish poet and playwright Henrik Hertz’s verse drama King René’s Daughter. 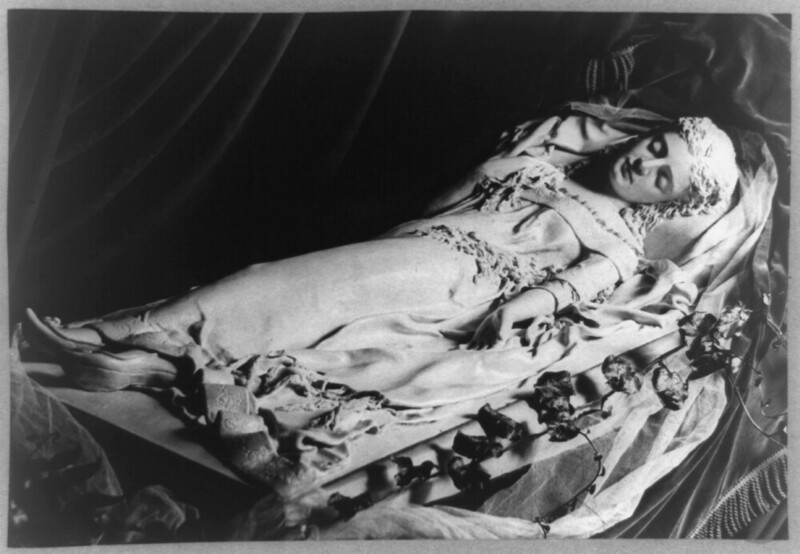 Dreaming Iolanthe, as it was known, was exhibited at a Cincinnati gallery in 1874 for two weeks and attracted more than two thousand people keen to catch a glimpse of the sleeping princess rendered in dairy product. Continuing on the same subject, Brooks made a bas-relief bust of Iolanthe for the Centennial Exhibition held in Philadelphia in 1876 and a full-sized sculpture which was shipped to France and exhibited at the third Paris World’s Fair in 1878. She went on to study art in Paris and Florence, and although she later tended to forgo dairy for the more traditional medium of marble, she always continued to use butter as a material. Other notable sculptors to use butter as a medium include the Norwegian-American sculptor John Karl Daniels, whose creations were featured in the Louisiana Purchase Exposition, St. Louis, in 1904, and the Minnesota State Fair, 1910. Read more about the history of butter sculpting here. A Study in Butter – the dreaming Iolanthe, ca. 1878, by Caroline S. Brooks – Source. A Study in Butter – the awakening of Iolanthe, ca. 1878, by Caroline S. Brooks – Source. Caroline S. Brooks with a butter sculpture bas-relief of Columbus for the 1893 Columbian Exposition in Chicago – Source. 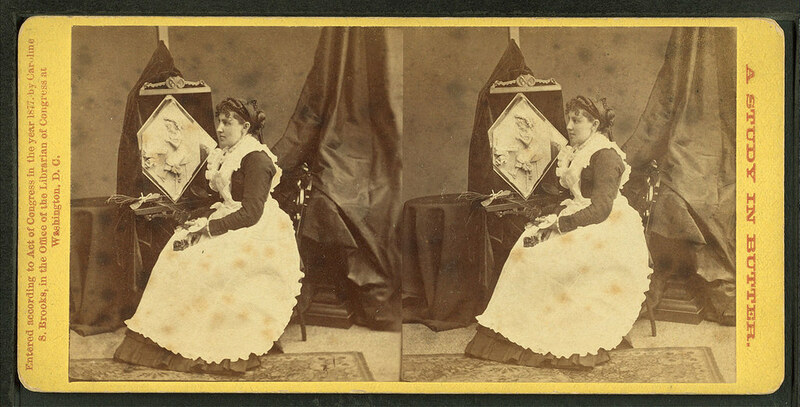 Caroline S. Brooks and her sculpture in butter during a public exhibition at Armory Hall in 1877 – Source. John K. Daniels’s butter sculpture of Father Hennepin and guides discovering St. Anthony Falls, Louisiana Purchase Exposition, St. Louis, 1904 – Source. John K. Daniels’s butter sculpture of Teddy Roosevelt, Minnesota State Fair, 1910. Sponsored by Milton Dairy – Source.